A guest post by talented artist and London Historians Member, Liam O’Farrell. 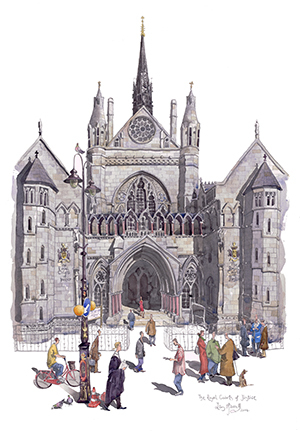 And an offer to buy the painting or limited edition print at a special London Historians cut price rate. See below for details. I am a member of London Historians, a group of like-minded London history enthusiasts. Director Mike Paterson invited me along to one of its tours: the Royal Courts of Justice in The Strand. I have a keen interest in history and am an artist who is enthusiastic about architecture so this tour was not to be missed. I’ve often passed this imposing building while riding buses and the goings-on are a common feature on the TV news, ranging from infamous cases such as the Leveson Enquiry on the media’s alleged misdemeanours to the rather bizarre incident of Heather Mills throwing a jug of water over Paul McCartney’s lawyer, Fiona Shackleton. Heather was apparently dismayed at only receiving a £24.3million divorce settlement compared with the £125million which court papers revealed she had demanded. Life can be so very tough. The courts were designed by architect George Edmund Street. Work began on the huge 6 acre site in 1873 and was officially opened in 1882 by Queen Victoria. Over the years extensions have been added, so currently there are 78 courts within. There was potentially a great deal to get through and so our guide creamed the very best to put in our 90 minute tour. Our guide for the day was Colin Davey, a qualified City of London Guide Lecturer, City of Westminster Guide Lecturer and National Trust Guide, as well as being a fellow London Historians Member. He has also spent many years as a practising lawyer so proved ideal for this tour adding much detail and knowledge beyond that of the average guide. We began our tour in the Great Hall. Colin initially gave us a quick overview of the building’s history and function. I was surprised to hear that they do not hold criminal trials at the RCJ: these take place at criminal courts such as the Old Bailey or equivalent. In the RCJ they deal mainly with Civil Law, dealing with matters such as inquests, high value divorce proceedings as well as intellectual property and other commercial disputes. The Royal Courts are, however, courts of appeal, hence the necessity for cells on the premises. Colin went on to tell us about the numerous paintings and statues of past judges and various other law related cognoscenti who have made a name for themselves over the years. 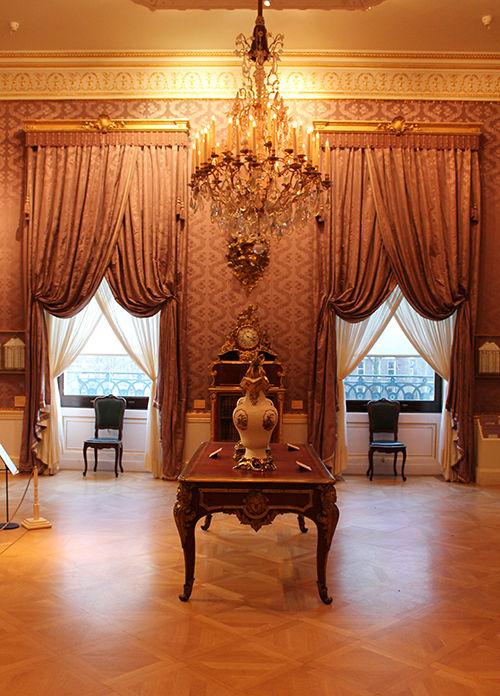 We then moved around the corridors and rooms, learning about the functions and histories of each. Highlights included the ‘Bear Garden’ which neither contains a garden or – you will be relieved to hear – any bears either. It’s an elegant galleried Gothic room, called the ‘Bear Garden’ supposedly by Queen Victoria who said that the bickering barristers sounded like a bear pit or garden where the hapless bears were goaded to fight dogs. 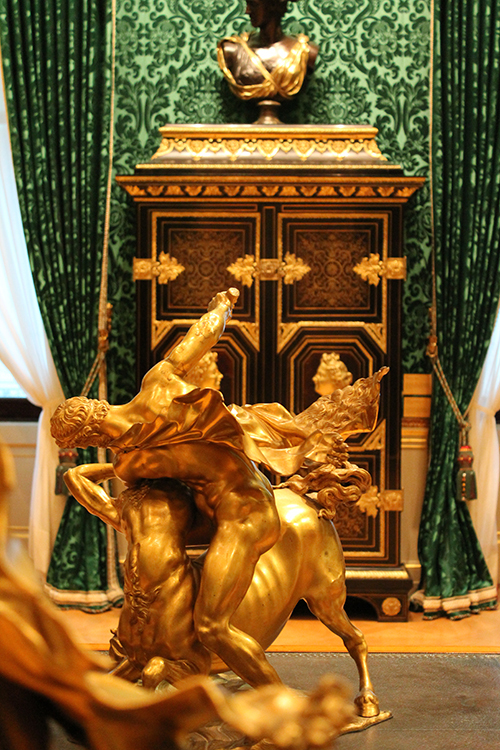 Adjoining this is the resplendent ‘Painted Room’ in glittering Victorian green, red and gold über camp. If Liberace were still with us this is where he would like to do lunch. It is however used as the judges’ robing room. Once the tour was complete we continued the law theme with lunch at Middle Temple Hall on the other side of the Strand. It’s an original Elizabethan hall measuring 110 feet long and spanned by a blacked double hammer-beam roof. 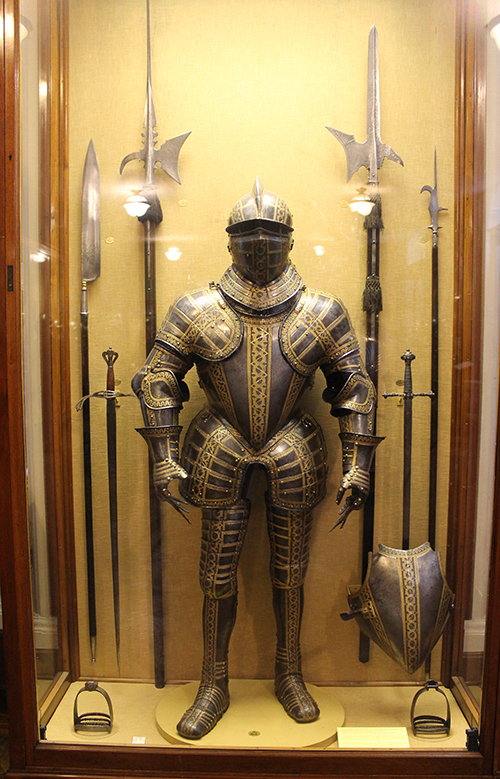 It has been in continual use as the eating and mooting hall of the Middle Temple since its inception in 1573. Shakespeare buffs might know that the first recorded performance of Twelfth Night too was played in the Middle Temple Hall. This was a particular treat for us as the general public is not routinely allowed to walk in off the street. But Mike had booked one of the large refectory tables and we sat down for a hearty lunch at a pretty reasonable price. It is not often you can eat while musing over a collection of original Van Dykes staring down at you. 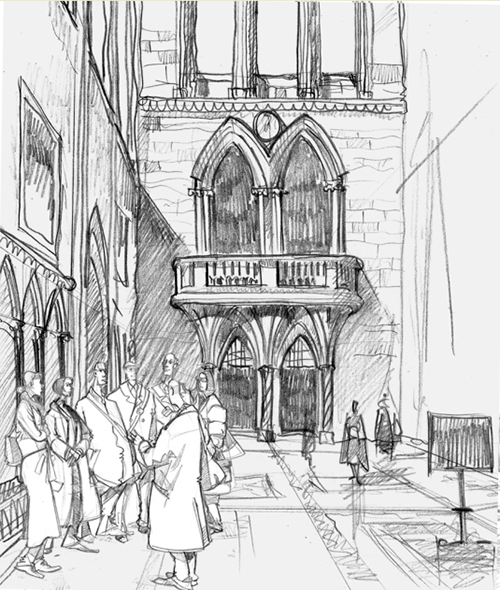 The tour of The Royal Courts of justice was a real treat and big thanks to Mike Paterson and Colin Davey for an excellent afternoon and plenty of subject matter for my sketchbook. I could have painted the whole of the building though I felt the characters would get lost in the immensity of it all, and it would somehow dilute itself in the process. After some musing I decided to paint the great arched entrance to the front façade. This is where much action takes place, a gaping mouth of a door where all the journalists, cameramen and crowds gather to get the latest on the progress within. It’s also where all the winners and losers spill out to give their side of the story or to dash off as quickly as they can to reassess their thoughts and wallets. 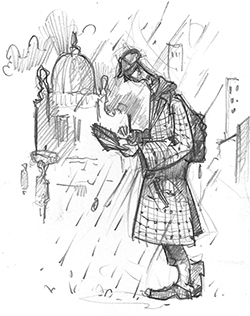 To begin my drawing I positioned myself across the street outside the George pub. I had the occasional company of the pub’s smokers and it also afforded me a little bit of cover as the weather was utterly foul. I got the bones in of what I needed fairly quickly, I needed to hurry as even with my modest shelter the rain was still coming in and my paper was turning to soggy loo roll with my pencils either slipping across the top or gouging messy holes. This picture would have to be finished off in the studio. And so it was. £120. London Historians Member price: £100. Dimensions: 37cm x 54cm with a white border surround. Contact Liam O’Farrell directly by email liamo@liamofarrell.com, mobile 07812 191082. Liam is also available to do commissions. 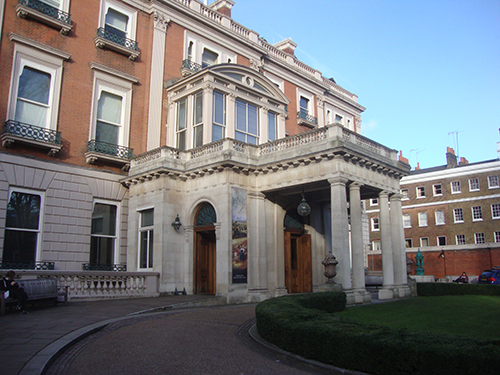 The other Sunday we drove into town and visited the Wallace Collection in Manchester Square; parked right outside for free, perfect. 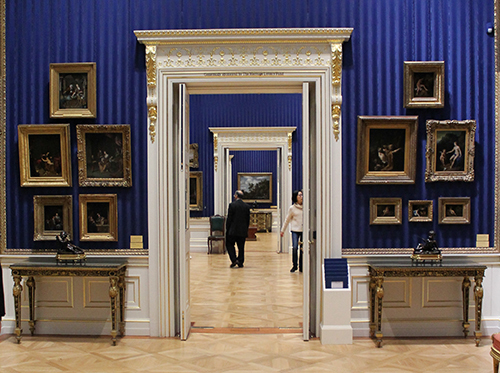 The gallery is free entry, more perfect still. This is under the terms laid down by the French woman who bequeathed the collection to the nation: Lady Wallace, née Amélie-Julie Castelnau, widow of Sir Richard Wallace. Another key stipulation was that no item from the collection may be lent, ever. 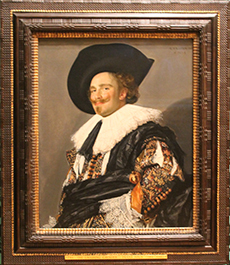 Hence, if you wish to see possibly its most famous object – The Laughing Cavalier by Frans Hals – you can only see it here. 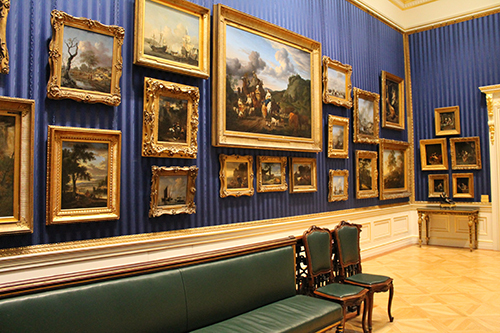 More significantly, perhaps, is that thanks to her, the institution is known as the Wallace Collection, in honour of her late husband, and not the Hertford Collection, the aristocratic family into which he was illegitimately born in 1818. But probably most importantly of all, Lady Wallace ensured that the overwhelming bulk of the Hertford treasure ended up in London rather than Paris. We owe her much. 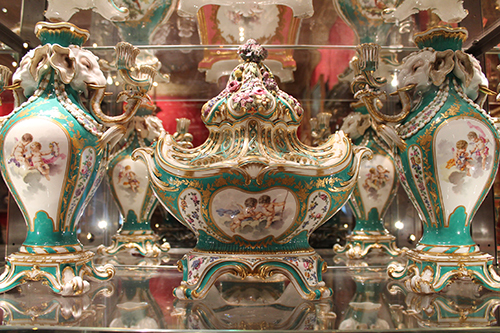 Sir Richard Wallace and his father, the 4th Marquis of Hertford, were both connoisseurs, collectors and devoted Francophiles, spending most of their time in France, mainly Paris. Lord Hertford died rather inconveniently during the Franco Prussian war of 1870 at a time when Richard mucked in as a generous benefactor of war relief for Parisians and the French soldiery, making a name for himself on both sides of the Channel. 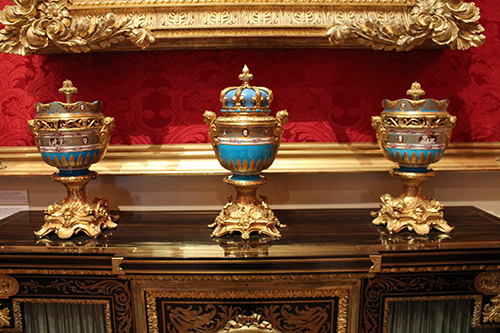 Richard inherited most of the estate, which included the massive collection and properties in Paris, London and Ireland. 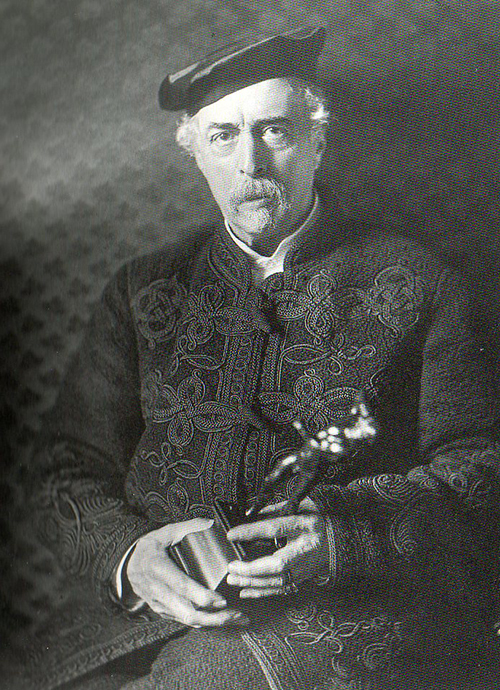 Sir Richard Wallace, Bt. 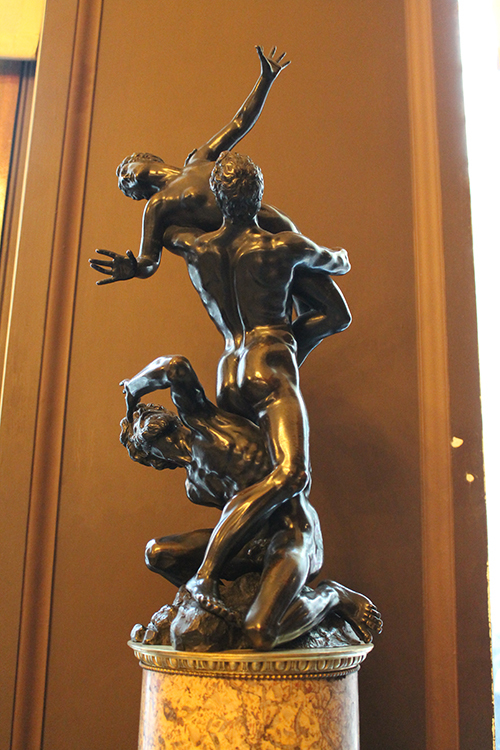 (1818 – 1890). What a jacket. 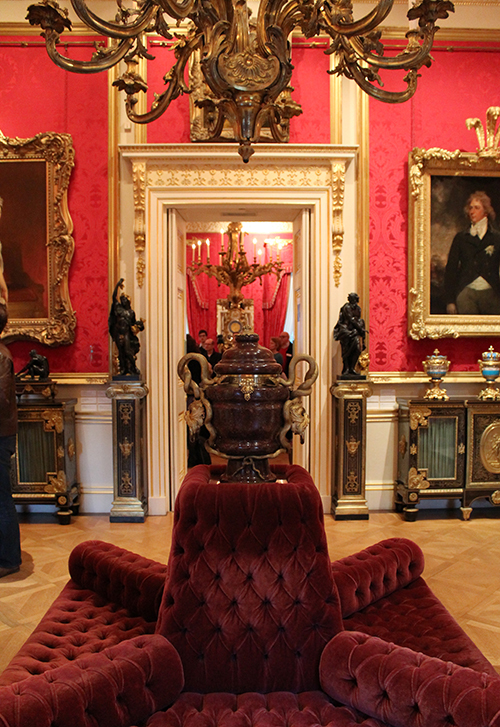 The Wallace Collection – assembled mainly by the 4th Dukes of Hertford and Sir Richard Wallace – is extremely eclectic. 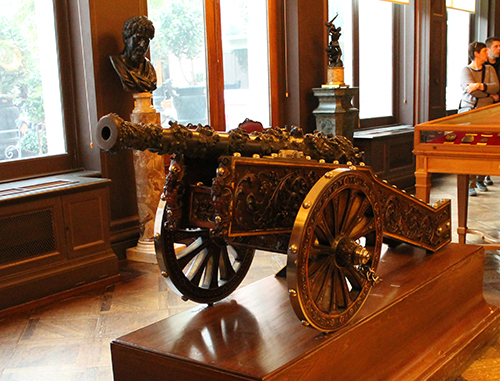 It comprises paintings, furniture, glassware, sculpture, jewellery, ceramics, china, clocks, medallions, illuminated manuscripts and a massive dollop of medieval and Eastern armour. There is very little English to speak of. 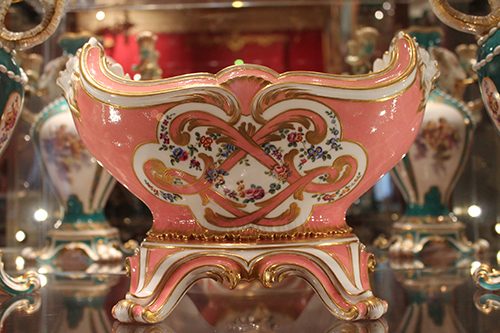 Its overall flavour, I think, is represented by extremely luxurious 18C French objects. Rich gold, pinks, blues, aquamarines abound: you could contract diabetes looking at this stuff for too long. 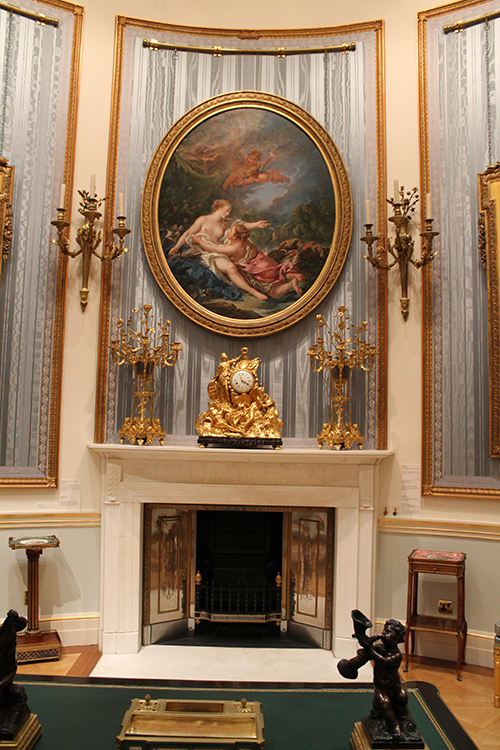 I remember when first I visited Hertford House – it must have been 25 years ago – finding it all rather overwhelming. In fact, I didn’t care for it much. But subsequent visits, informed by things one has picked up over the years, has made me appreciate this institution so much more. 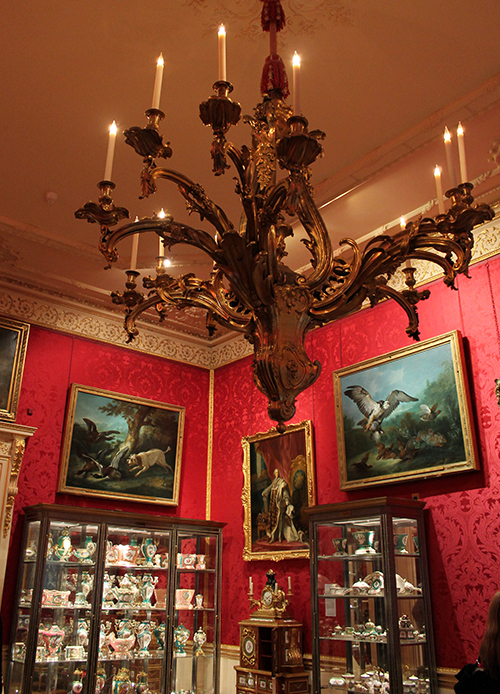 So definitely an acquired taste and while I may never fully fall in love with the Wallace Collection, I will always derive much pleasure from visiting, and I think you will too. Here are a few randomly selected images from our visit. All pics by Fiona Pretorius. 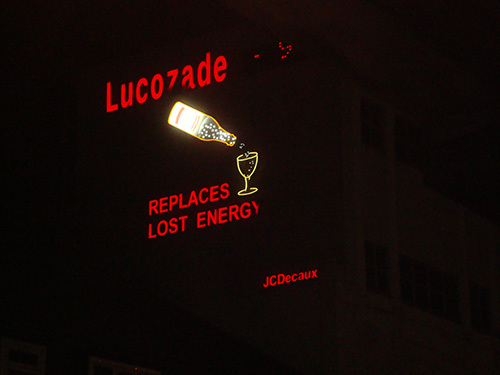 Last November, outdoor advertising giant JCDecaux applied to Hounslow Council to change the famous Lucozade sign next to the M4 flyover in Brentford. They wished to switch the animated neon sign for a modern technology giant LCD screen, the type which has become commonplace on major trunk roads in recent years. The content was to remain Lucozade. Locals (including me) got wind of this very late and there was outrage that the beloved sign was in danger. But on 31 January, the council turned down the application to sighs of relief all round. I announced this on Twitter which evinced a huge and positive response, and not just from Brentfordians. The sign is widely loved, it seems. Read more here. Not very good film clip by me on YouTube, here. The current sign is, in fact, a 2010 replica of the original 1954 version which was on a building about 250 yards east of the current site. The first sign is stored in Gunnersbury Park Museum (worth visiting). Lucozade was a locally manufactured product along with other household names such as Mcleans toothpaste and Brylcreem. That remained the situation despite various mergers and takeovers over the late 20th century resulting finally in the pharmaceutical giant GSK. GSK offloaded the Lucozade brand to Japanese company Suntory last year, giving rise to the current Lucozade sign brouhaha. I think this affair raises a lot of questions. First, if the owners of Lucozade decided they no longer wanted to pay for advertising, would it be okay for them to get free publicity on the massively busy M4 flyover? Furthermore, who would then pay for the electricity and maintenance of the sign? JC Decaux? Hounslow Council? English Heritage? I don’t think so. There is a precedent, of sorts. 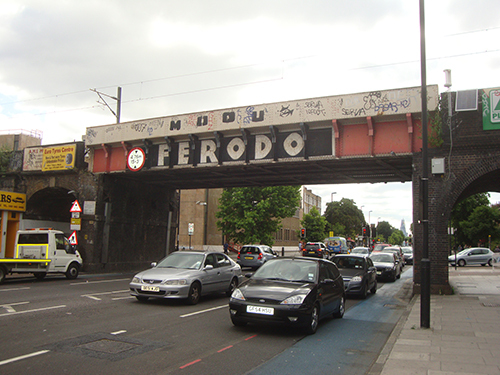 Back in sixties, Ferodo – makers of brakes and related accessories – decided that their medium of choice was to be railway bridges and the deal was done, presumably with British Rail at that time. Of course, when the deal came to an end, clever Ferodo got many years of free advertising. 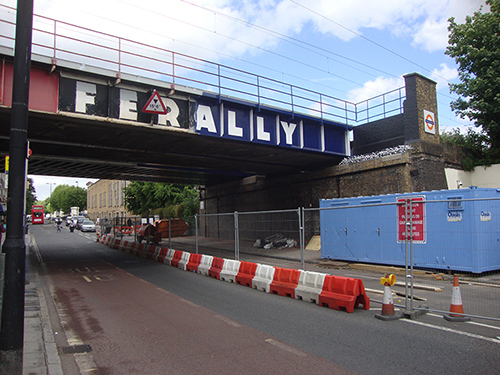 Last year, the one on the Caledonian Road got painted over but I saw another one still proudly with us in Bow. There must be others. Of course, there are key differences. Ferodo brake pads are less personal products than Lucozade and crucially, the Ferodo signs are ubiquitous whereas the Lucozade sign is a one-off and has strong local connections. For the moment. But what else is going on here? This is pure speculation on my part. Suntory have picked up Lucozade, and with it the Brentford sign, which like it or not, they’re obliged to keep going. What to do? Change the sign for a modern one while committing to keeping the advertisement exclusively Lucozade as a sop to local and motorway traveler sentiment while fulfilling the heritage brief. Then, it’s the easiest thing in the world to change to other advertisers later because with a modern sign, the heritage argument has actually been lethally undermined. Suntory and JC Decaux will be back. In the end, I think they will win. For some of the above reasons, I believe we must reluctantly accept that the sign will eventually go, there are much more deserving things to fight for around London. Equally as worthy in my opinion, but I didn’t hear anyone complaining (except me!) when we lost the lovely Christmas trees on the old Beecham building after Barratt Homes took it over. George III was very interested in maps, collecting them in huge numbers, along with views, architectural drawings and miscellaneous printed ephemera. George IV, by contrast, was not. He dearly wished to convert his father’s library at Buck House into a ball room and very quickly began to dispose of the collection. Fortunately they were taken up by the British Museum and in 1973 ended up in their logical home: the British Library. 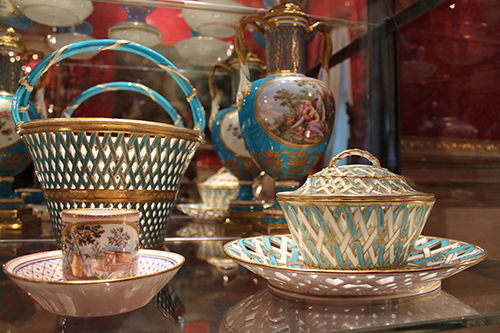 The total collection amounts to over 60,000 item of which around 1,200 are directly London-related. While the British Library possesses 4.5 million maps in total, this is a very shiny jewel indeed. The collection includes all the great maps of London in the original and because they were acquired through royal patronage and acquisition, they are best quality and in a very many cases, unique. Gems include original drawings by Robert Adam of the Adelphi and all the London churches by Hawksmoor. These represent the tip of an iceberg of drawings and plans from the leading architects of Georgian London. There are other etchings, engravings and views. Being famously miserly, George would encourage his buyers to pick up unsold items at auction. The result is that the collection also contains a large amount of ephemera, unloved in their day by connoisseurs but of massive value to the modern historian. Wenceslaus Hollar’s famous survey of the destruction from the Great Fire, executed in 1667. Collection of the British Library. Led by BL’s Head of Map Collections, Peter Barber, the department recently embarked on a project to digitise King George III’s Topographical Collection (K Top for short) in its entirely. With only their own staff to call upon and the work being too technical for volunteers, Unlock London Maps is expected to take at least four years but will be released online as it goes. Some, like those in this post, are already available. As a lover of maps, the prospect of further releases is a delicious one. But the project needs to raise funds. The £100,000 overall target is a vital yet realistic number in this day and age and we encourage you to make a donation, large or small. Please do so via the Unlock London Maps Page. We’ve organised a behind the scenes visit of BL’s Maps Collection on 12 June to view some of this treasure. It will be led by Peter himself. All of the £15 ticket money will go towards the fund. Members only, I’m afraid. If that’s you, make your booking here. Here are a few more lovely examples from K Top. Thamesis Descriptio by Robert Adams, the Queen’s architect, in anticipation of Spanish Invasion, 1588. Note South-North orientation. Collection of the British Library. 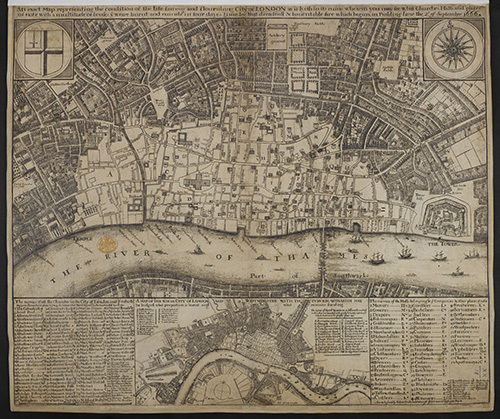 Gorgeous pocket map of London published in 1738 by Elizabeth Foster, after her late husband, George Foster. Collection of the British Library. Hand-coloured map of the parish of St. Pancras, by J Tompson, 1804. Collection of the British Library. 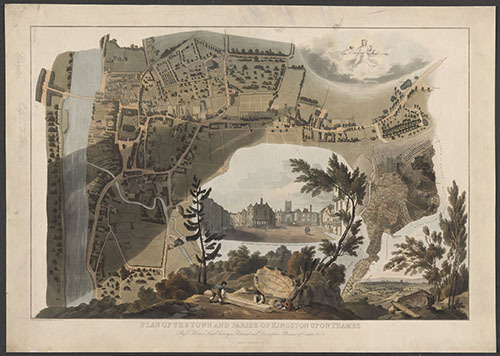 T Horner’s plan and view of Kington upon Thames, 1813. Collection of the British Library.